Pigeon, a brilliant digital photo sharing device. Take a picture on your mobile and with one click it will show up in minutes on Grandma's Pigeon picture frame whether she lives around the block or in another time zone. Our Pigeon digital photo frames are built using state-of-the-art technology but are still simple to use. 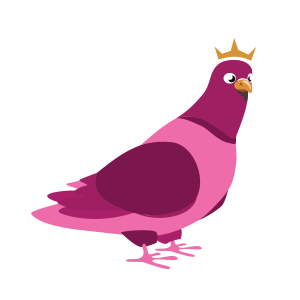 Pigeon picture frames are ready to go out of the box, simply enter the password to your wireless system. Pigeons are outfitted with the latest Wi-Fi technology which allows contributors’ photos and videos to be automatically synced with a Pigeon Picture Frame from anywhere in the world. Hear those first words being spoken, the sweet sound of baby laughter or happy tunes anytime. Contributors to the Pigeon picture frame use the Pigeon App, which is the secret handshake to allow automatic transfer and display of contributors’ photos and videos to the linked Pigeon Picture Frame. Part conservation, part safety and part cool. The Pigeon’s motion sensor makes sure that it's on when you're there and off when you're not. Using the simple Pigeon App, one Pigeon picture frame can have multiple contributors letting different family members send their memories to the same frame, anytime.